Meet Lillian. She’s a master of manipulation and guilt tripper extraordinairre. Friends, I want to give you a little glimpse into my world right now. Look at that sweet little face. Look into those beautiful, bright blue eyes. You can’t have a lollipop if you don’t eat any of your dinner. This morning, this face was accompanied by desperate sobs of “Mommy! Don’t go! I want you to stay with me! I’m scared!” I kept telling her, “It’s not like I want to go to work! I’d so much rather just hang out with you here all day.” I could feel the tears welling up in my eyes but I didn’t want to get emotional and make it worse. You see, this is her first full week in a new classroom. The whole drop-off routine is different all of a sudden and I can see why she may not be thrilled about it. Preschool is mayhem. There are children between the ages of 2-5 eating breakfast (if the food hasn’t all been eaten by the time we arrive), playing, yelling, and fighting. I haven’t yet figured out how to know where breakfast is going to be – it could be in any one of three different rooms. There’s not much structure at this time and children of this age are all over the place and loud. Not the most welcoming environment for an anxious preschooler who rages out when things don’t follow her expectations. So this morning, after her teacher saved me with distractionary techniques, and I rolled into work 20 minutes late, I was explaining to my boss why I was so late to work, and the tears just started coming. People were coming to me in the halls as I was cry-laughing telling my story and I was really moved to hear other people’s stories of children making them feel like garbage, too. The next time you feel like you’re failing or you make a mistake that your tiny people won’t let you come back from, just know that they all do it. Solidarity! One of the perks of sending Gabby to private school was the uniforms. No fighting about clothes everyday. I had high hopes that uniforms would make the laundry so much easier. I was desperately wrong. White uniform shirts for pre-schoolers? Are you freaking kidding me?!?! How is the pajama pile so much bigger than the daywear pile? 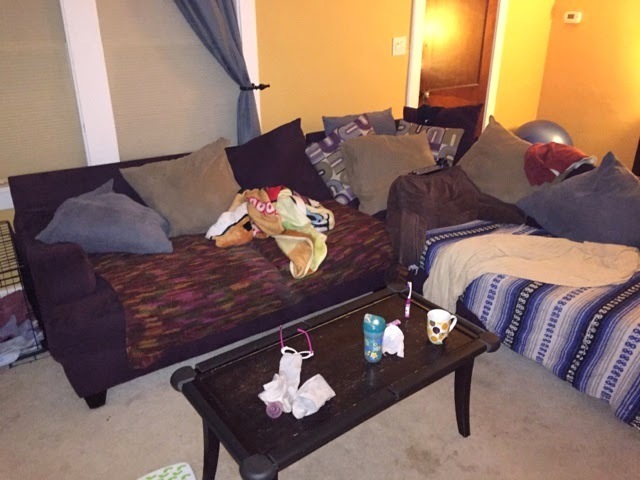 Judging by their laundry, a stranger would believe they never leave the house. Lillian is perpetually out of pants because she is constantly peeing in them. I refuse to go back to diapers. Thus, I get to forever be washing, folding, and putting away pants and underwear. Lillian’s underwear pile is so much bigger than Gabby’s, I think I need to have a conversation with Gabby about changing her underwear on a daily basis. Onto the hubster, what is happening in his pants that causes him to blow out the crotch of every pair of underwear so violently? 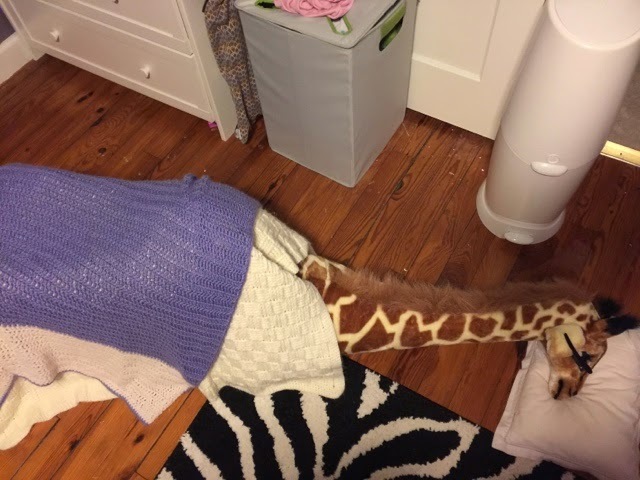 Do you have any WTF moments while putting away your family’s laundry? It all started when I went back to work when Gabby was 7 months old. She had never been away from me and was so attached that I did my best to NOT walk the 200 steps over to the daycare multiple times a day to make sure she was ok. It was good for her to not be ripped from my arms so often. It was the right thing to do. But the act of leaving meant that I was missing out on the best part of her day. I’m not saying that she wasn’t happy to be home and with her two loving parents. I’m saying she used up all of her good, happy time at school and had nothing left at the end of the day. We, her parents, had nothing left at the end of the day. And so it seemed pointless. And when it feels like there MUST be a better way, and you don’t change what you’re doing, you enter an emotional vacuum. It gets better and it gets worse. With Lillian, I DID go to see her during the day a time or two when I could because I wanted to watch her play and hold her when I was having a bad day. She handled me leaving better, because my coming and going was a constant and she started daycare when she was 13 weeks old. But she is a child who needs a lot of sleep. Her bedtime for the first year was 6:30 PM. I literally got one hour with her after work before I had to rush her screaming, exhausted body to bed. Nighttime nursing was as exhausting as it was a comfort to us both. We were all getting a raw deal. This is the complete opposite of my experience and I know why. Home is their safe place. They know Mom and Dad love them unconditionally. So, when they get transferred back into my care, the listening ears shut off and the meltdown floodgates open because they are tired. They are tired of learning, obeying, following instructions, and being told what to do. They need a release. And I completely get that. 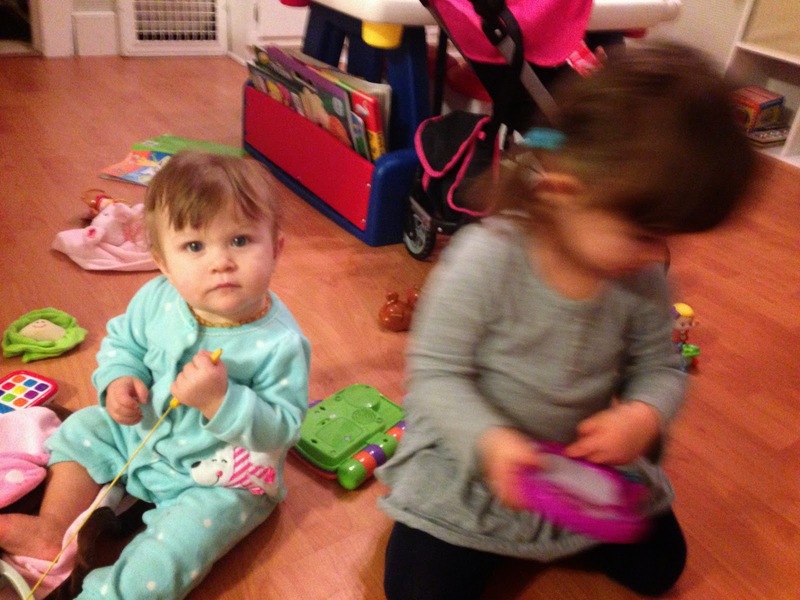 But I still resent missing out on the best parts of their day. You guys, don’t judge me. This is a major source of shame for me right now. I have been just barely hanging in there. I am so stressed out and run ragged that I just cannot do everything or pretend to anymore. Have you seen that graphic with the three points that says that of being sane, having a clean house, or having happy kids you can only have two? Find it here. Well, I’ve made my decision: happy kids and sanity won. Everything else is falling by the wayside. 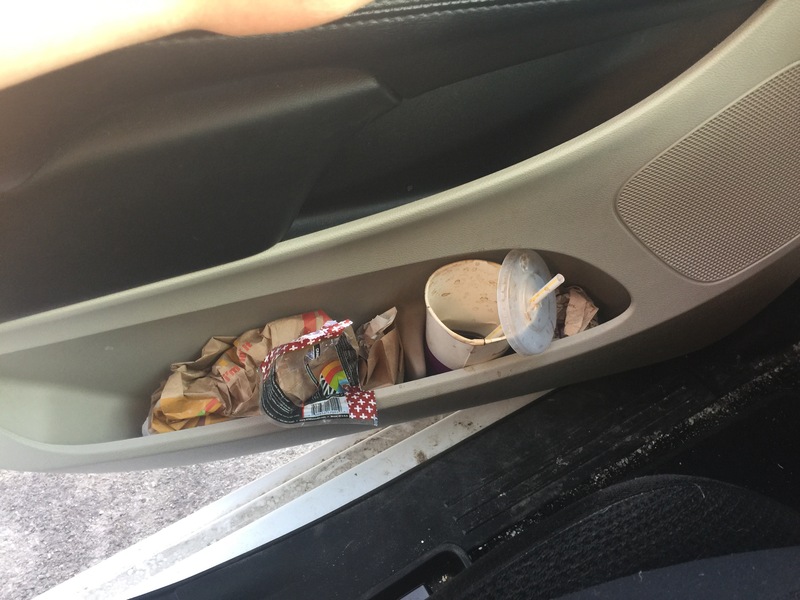 Exhibit A. I not only live and eat in my car, but I store the garbage in the driver’s side door. This disgusting mess causes me so much anxiety! I just cannot seem to remember to bring a bag out to my car to collect it and throw it away. When I pick up or drop off the kids at daycare, I am always afraid that another parent that I like will notice that half-full cup of diet coke and realize that I am a crazy person. It’s just not acceptable. Then there’s the laundry situation. I can’t make myself wash the dirty stuff and I can’t make myself fold the clean stuff. There are piles everywhere. We just make new piles when the old piles get too big. I can’t. The girls’ room. I don’t even pick up their toys anymore. Their room is upstairs. They only sleep in it. Lilly is in a “throw every book in the floor” phase. I’m over it. Finally… the bathroom. It’s just vile. There are way too many of us pooping in a single toilet. Too many people’s dirt going into one sad tub. Too many girls dropping hair all over the floor. If I deep-cleaned the bathroom weekly I think it would look and smell as bad as it does for as often as we clean it. I wipe out the sink and scrub the toilet almost daily. I can’t do it anymore. Nope. Not sleepy at all. Next month, it’ll have been 2 years since we have been living the two-working-parents life. With no family nearby, we had to make the extremely difficult decision to send our precious baby to full-time daycare. It is not easy to go from being with a baby 24/7 to only seeing her 2 hours in the morning and 2 hours before she goes to bed. That was a rough transition. However… Remember that time I wrote about how I am a Type A person with no ability to stick to a routine? Without daycare, I never would have gotten Gabby on any kind of schedule. What I learned with Gabby was to let the daycare teachers set her schedule and then just stick to it at home. I had a much easier time with Lilly. Also, those ladies know how to guide an infant toward toddlerhood. 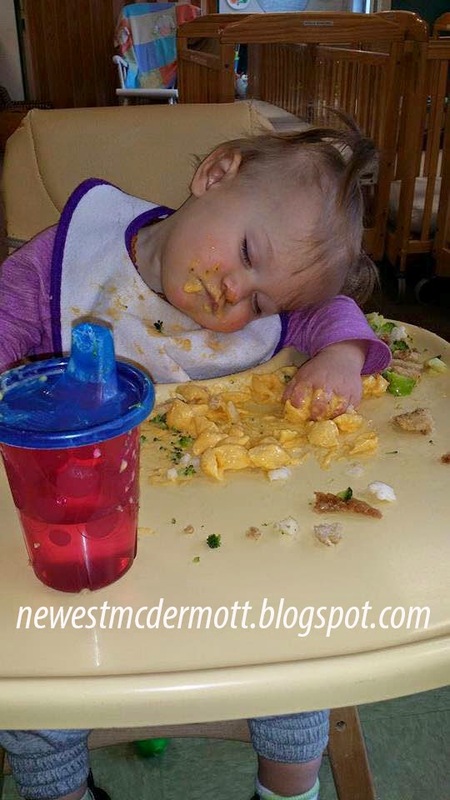 I have gone to them time and time again to ask for advice on how to get my kids to sleep (because even when they are giving me a hard time napping at home, they just go to sleep like little angels at daycare), how to get them to eat, what is developmentally normal, etc. It’s like asking a pediatrician, but I don’t have to make an appointment because I am there every single day. Then there are the transitions. Daycare teachers who stick around are doing it because they love what they do. The pay is awful, benefits are minimal, and the work is exhausting. Most daycare teachers are waiting for a “real” teaching job and are only there temporarily. I’m assuming this is not as big of a problem at the pre-school and pre-K levels, but with infants and toddlers, there has been a near-constant shuffle of caregivers for my kids. Lilly is on her third lead teacher in the infant room and Gabby is on her third in the toddler room (and she had two different teachers when she was in infants). That is a lot of transition for a kid who needs to feel security and comfort if she is to be away from her parents all day. Then there is the bill. I do feel that the quality of care our kids receive is worth the money. It is just really difficult to me to “take home” negative dollars while my kids are in daycare. By the time Lilly is in Kindergarten, we will have paid more than I owe on my student loans. If I were to stay home with them for the next 4 years, I couldn’t guarantee that I could find a job locally – especially with the awesome boss I have and state benefits. It is worth the money. It is worth the sanity. There aren’t enough story times at the library to keep me from losing my mind from spending that much time away from adult topics of conversation. Daycare. I love it. I hate it. I don’t know what we would do without it. It doesn’t even seem right that our kitchen counter should look like this. We have TONS of cabinet space. 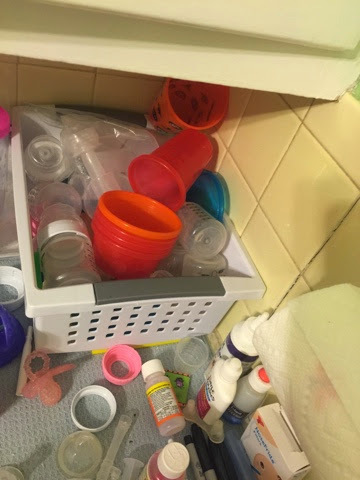 But when a toddler needs a drink, you damn well better materialize a cup from thin air (and it had better not be an OLD cup – better known as a cup from an hour ago). Also note the bottles and bottle accessories. This is also where we store the kids’ medicine. I know you’re jealous of my organization skills. Blankets covering every square inch of the couch. It’s covered in stains, but what I can’t see can’t hurt me. “Babies sleeping” in odd places. Imagine my horror when I walked into the kids’ dark bedroom and stumbled into this. For all I knew it was a dead burglar. 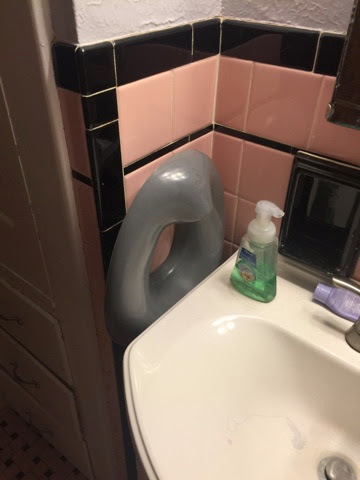 Potty seat hanging on the wall. How fancy are we that we have a special hook in the bathroom just for hanging the potty seat? Please ignore the filthy sink and 1950 tile job. We will probably move before the bathroom ever gets updated (or cleaned, haha). All the no-no items are up high. No not the breakable things, we don’t have any of those. I’m talking about the iphones, laptops, TV remotes. The items we would not survive parenthood without. It’s not sparkling clean, but it feels like home. I am SO over the morning routine. I think the morning is even worse than bedtime. 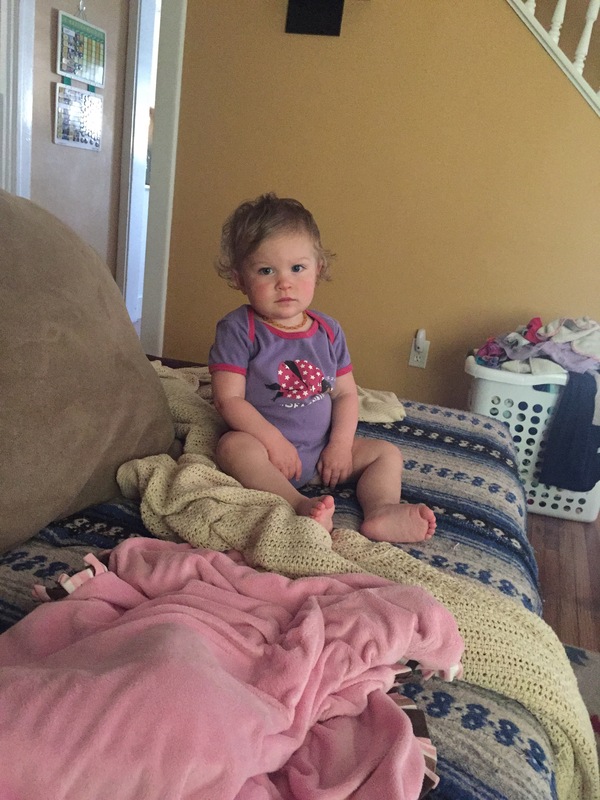 Add potty-training to the mix and the mornings are just 2.5 hours of arguing with a toddler and pulling an infant out of harm’s way… all before I even have to go to work. Most days, by the time I get to work, I am sweating, harried, and disgruntled from all of the running around, organizing and nagging I have to do. I could probably reduce some stress by preparing the night before, but who has the energy to do that?!?! And Lillian’s scream is something to behold. It will stop you in your tracks. 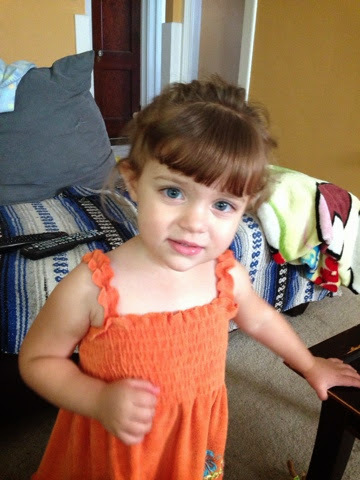 One of her teachers at daycare goes out of her way to avoid known triggers for her outbursts. I can’t avoid them. 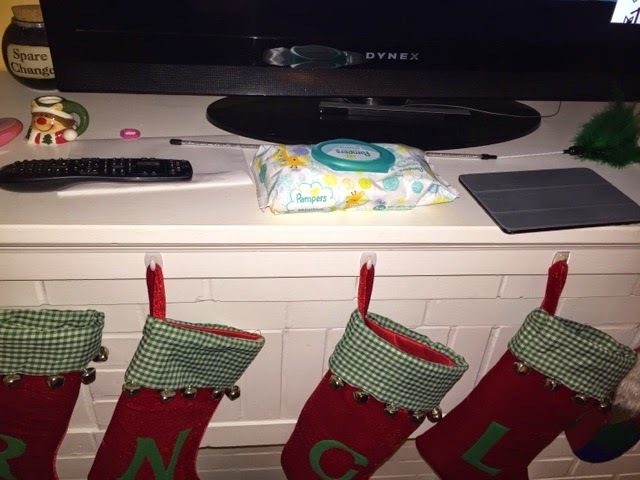 Diaper changes = screaming. Putting on a coat = screaming. Getting her in the car seat = screaming, I would almost prefer hearing Gabby incorrectly sing the alphabet at maximum volume. Serenity now. Serenity now. Serenity NOWWWWWWW! Does this look like a sick kid to you? When I called the doctor on Monday, they said “fever is a symptom, it doesn’t necessarily mean the child has an infection.” The doctor diagnosed her with a cold and sent us on our way. 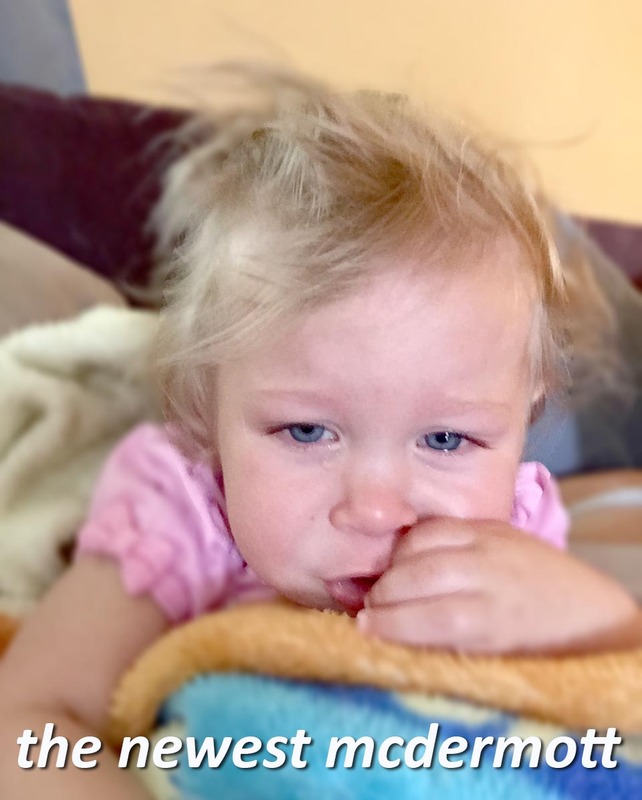 Tuesday, she got sent home from daycare with a 103.2 temperature and they asked me not to bring her back until she has been fever-free for 24 hours (shame on me for sending her with a cold/fever that she caught from some other kid in her class). Wednesday I stayed home again. Thursday, my husband stayed home and claimed she had a normal temperature. I took it after work because she felt hot to me, it was 102. Friday I stayed with her again. Today she reached 102.9 and was running around, playing, eating, acting fine. I know there is nothing wrong with this child. Could she be teething? Could this be a normal cold symptom? I have NO idea! All I know is that neither my husband nor I can afford to miss another day of work. Unfortunately, the daycare won’t take her if her temperature is over 100. My boss is not a fan of telecommuting and I am really at a loss for what to do. Update: It’s a urinary tract infection due to an anatomical abnormality. We will find out more when the doctor gets her urine culture results back. Her renal ultrasound is scheduled for 7/8 at 5:30. Pray for a normal scan!